Apparently the folks at American Standard, Coors, and Toto were unavailable for the job of Potty Planner. And these bad boys are a bargain! Only $500,000.00! As I often maintain: we have more planners than police…and more dollars than sense. 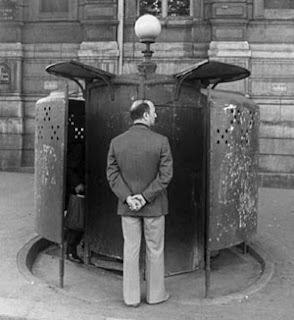 This is what pissoirs look like in cities that have used them. Women need not attempt to use these, it goes without saying. 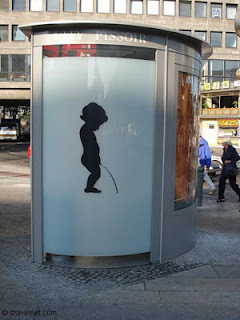 I know these guys are working so hard at looking “european” with our tax dollars, but if they’re just trying to get away from using city hall for the 24 hour toilet where an average of two persons a night use it for an average cost of $83.00 per potty, wouldn’t it just make sense to use these? Offbeat is how Portland’s Pet Pervert described why he came here. Now a white supremest group is collecting here in the People’s Republic for a white people music festival or some such thing. KGW has the story here. One of the nation’s largest white supremacy groups is descending on Portland. The Hammerskin Nation is planning to hold it’s annual Hammerfest music festival somewhere in Portland October 5-7. It’s interesting, the cops won’t say where the white people will have their white people music fest. One question: why do we keep attracting the nuts? Is it because it’s sooo liberal here that these guys want to thumb their noses at P town? Portland City Commissioner Erik Sten affirms yet again (memo here) that in their zeal to build up the downtown of Portland with condos, light rail, tax abatements and street cars, there isn’t enough money for the other parts of town. When you essentially pay people to move to the area (via abatements to developers) and then finance with tax increment financing which takes the cream off the top of property taxes that would otherwise go for schools, fire and police, what do you expect? Did you expect ‘the little people’ not to notice after awhile? TAO and Don Mc Intire have been telling you for YEARS–AT LEAST A DECADE–this would be the impact. You didn’t listen because he’s a right wing wacko? He was right about the unfunded Police and Fire retirement and disability fund, too, wasn’t he? problem caused by the urban renewal district in the first place. because their planning has forced them out. “The intense attention rightly focused on maintaining a healthy downtown—let’s not forget how unprecedented and novel Portland’s original successes were in this regard—has yielded such a robust engine of real estate development that its side effects have grown into problems of considerable scale. That’s what the Zero’s editorial writers would like you to believe. At the same time it runs a series of stories on Measure 49…a measure written to DEPRIVE you of your property laws…and doesn’t bat an eyelash. You know what this is…this is one of those cases where they pat the head of the laundry hanging suburban wife and her kindred and say…you can have your clothesline, honey, but don’t worry your pretty little head about the RIGHTS YOU HAVE TO THE LAND THE CLOTHESLINE SITS ON! That’s right…just be quiet …and go lie down by your bowl! Measure 49 is a land steal by the Oregon state legislature to REPEAL measure 37…because it gave you the rights you on your property when you bought it or got it. Measure 37 gave those rights back to you; Measure 49—the repeal of the law—takes the vast majority of your own property rights from you. It’s as basic as that. State Senator Jason Atkinson gives a great analysis of the two measures here. Voters have voted twice to give people land owners payment if the government takes it. Voters understand this because it’s fair. It’s a fifth amendment right in the US constitution…preventing a takings without just compensation but to the planning poohbahs…your rights don’t exist. Their plans trump the constitution. of record The Zero is story after story. Earlier this week there was the usual scare story about shopping centers that would be placed in nowheresville Oregon and similar urban myths—and you don’t find out until the jump page in the 20th paragraph that professors at Portland State University think that IT IS highly unlikely because of market forces. That’s right, they acknowledge it wouldn’t be in the land owners’ interest to build in the middle of nowheresville BECAUSE THERE ARE NO CUSTOMERS THERE. So…the Zero’s reporters don’t think it’s important enough to tell you that if the market wouldn’t support a shopping center in the middle of a strawberry field in nowheresville that you-mr and mrs. Land Owner WOULDN’T BUILD IT BECAUSE IT’S NOT IN THEIR BEST INTEREST. Rewrote it, claim transferability—but there’s no language in the measure that allows it, took out your rights, put curbs on what you could do with your, land just like before …and then had the audacity to say they were fixing measure 37. I want to know…how you will vote on Measure 49…yes or no. Vote NO on M 49. By the way, I have no measure 37 claim and no dog in this fight except that as an American I believe in property rights. And for you naysayers, I do believe in zoning. In fact I believe in it so much that I believe local jurisdictions should be able to zone strip clubs away from schools—but apparently planners think that situation’s just fine. George Soros doesn’t like America until it’s remade into his own image. But the way in which he’s going about it is to fund anti American causes. Investor’s Business Daily has been doing a series on Soros (find it HERE). You may think IBD is conservative–and you’re right–its editorial pages certainly are but lookie what George has been up to. How many people, for instance, know that James Hansen, a man billed as a lonely “NASA whistleblower” standing up to the mighty U.S. government, was really funded by Soros’ Open Society Institute , which gave him “legal and media advice”? That’s right, Hansen was packaged for the media by Soros’ flagship “philanthropy,” by as much as $720,000, most likely under the OSI’s “politicization of science” program. Didn’t the mainstream media report that 2006’s vast immigration rallies across the country began as a spontaneous uprising of 2 million angry Mexican-flag waving illegal immigrants demanding U.S. citizenship in Los Angeles, egged on only by a local Spanish-language radio announcer? Do people know last year’s Supreme Court ruling abolishing special military commissions for terrorists at Guantanamo was a Soros project? OSI gave support to Georgetown lawyers in 2006 to win Hamdan v. Rumsfeld — for the terrorists. OSI also gave cash to other radicals who pressured the Transportation Security Administration to scrap a program called “Secure Flight,” which matched flight passenger lists with terrorist names. It gave more cash to other left-wing lawyers who persuaded a Texas judge to block cell phone tracking of terrorists. Soros’ “shaping public policies,” as OSI calls it, is not illegal. But it’s a problem for democracy because it drives issues with cash and then only lets the public know about it after it’s old news. Hillary Clinton has publicly announced that she is not a lesbian. Hillary Clinton officially declared she’s not a lesbian – not that there’s anything wrong with that. “People say a lot of things about me, so I really don’t pay any attention to it,” Sen. Clinton (D-N.Y.) replied. Kennedy told the Daily News he’s convinced. “I 100% believe she’s a straight, heterosexual woman,” he said. Charges are Dropped: Where Do the Marines Go to get their Reputations Back? Not to Congressman Jack Murtha who called them terrorists and killers. The prosecutions of Marines involved in the case have slowly unravelled, however. Capt McConnell and another officer, Captain Randy Stone, have both had charges of failing to investigate the killing withdrawn. Two soldiers originally charged with murder in the case have also been cleared, while an investigating officer has recommended that charges against a third soldier are also dropped. That would leave only one soldier, Staff Sergeant Frank Wuterich, facing murder charges in connection with the deaths.